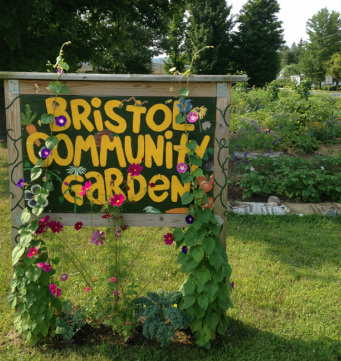 We are a small community garden located on the corner of West Pleasant and Liberty streets in Bristol, Vermont. We have approximately 25 garden plots that are tended by 20+ community members throughout the growing season. We are extremely grateful to Kathleen and Martin Clark of Martin's Hardware, who have offered the use of their land for this community garden. We are so happy that you are interested in tending a garden plot at our Community Garden! No pesticides, herbicides, or other chemicals are allowed in our gardens. The plots are approximately 4x29’ each. Water, organic compost, some garden tools, and wheel barrow are provided. Applications are accepted on a first-come, first-serve basis.